We ask in the Collect for today's feast: "O God, who willed that your Word should take on the reality of human flesh in the womb of the Virgin Mary, grant, we pray, that we, who confess our Redeemer to be God and man, may merit to become partakers even in his divine nature. Who lives and reigns with you in the unity of the Holy Spirit, one God, for ever and ever. 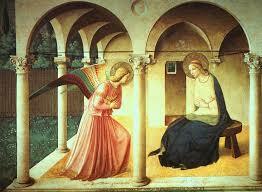 When the angel came to Mary, she was troubled, but she also was open to what God was asking of her. She could not understand how this would come about, but she was willing to conceive a son and the angel told her to not be afraid for she had found favor with God. I think that is what we all want to here from our angels: that we have found favor with God. May we be able to say with Mary, "Be it done unto me according to your word." We give ourselves again to God today and let God decide how He wants to use us. I heard yesterday of the death of a dear friend, June McNally. Please pray for her and the family.